American Airlines is an amazing example of the new rules of marketing and public relations at work throughout an organization. 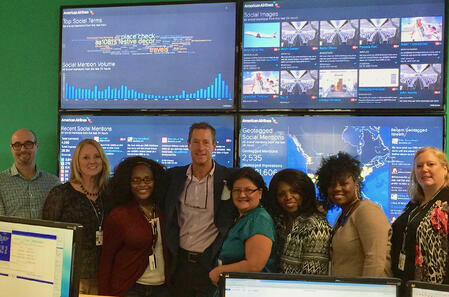 Recently, I went to the company’s Dallas headquarters to learn how the airline uses real-time social networking to communicate with customers. In this excerpt from new 6th edition of my book The New Rules of Marketing and PR released this week, I share how important real-time customer communications are for running the entire airline all the way up to the CEO. While on a recent American Airlines flight I was introduced to a well-behaved German shepherd named Kobuk. His handler is Elizabeth Fossett of the nonprofit Maine Search & Rescue Dogs team. She told me how Kobuk had searched for hours to find a 77-year-old woman with diabetes and dementia who had been lost in the woods for several nights: no water, no food, and none of her medications. Kobuk had just traveled across the United States with Fossett to attend a ceremony at American Humane. For saving the woman’s life, he was being honored with the 2016 Hero Dog Award: Search & Rescue Dog. Of course, I had to get a photo with Kobuk! And then, naturally, I had to share it with my followers. 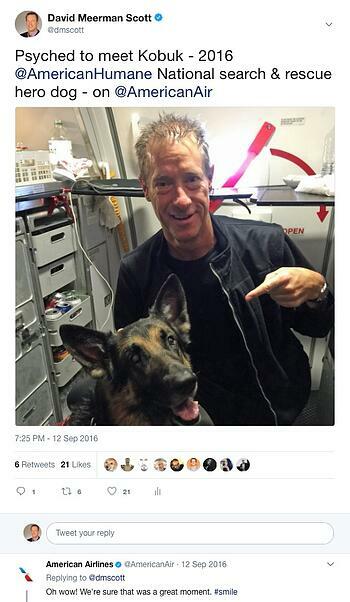 So I tweeted the photo with the text “Psyched to meet Kobuk - 2016 @AmericanHumane National search & rescue hero dog - on @AmericanAir.” Within a few minutes, American Airlines thoughtfully tweeted back to me: “@dmscott Oh wow! We're sure that was a great moment. #smile.” Seeing that response—and many others like it over the years—there was no question in my mind that the airline’s people pay attention to every message they receive and, when appropriate, craft a personal response. There are no generic “thanks for sharing” type responses on the @AmericanAir feed. American Airlines is also fast to respond to Direct Messages on Twitter, and to similar communications in other social networks. As a frequent traveler on the airline, I sometimes tweet questions. A response typically comes within 15 minutes. I was impressed and wanted to learn more about how the world’s largest airline uses real-time communications. I flew to the company’s Dallas/Fort Worth headquarters to spend the day with Jonathan Pierce, director of social media and content services, and more than a dozen of his American Airlines colleagues. I went there expecting to learn how the airline uses real-time social networking to engage with customers and solve their problems. But I hadn’t expected to learn how important these interactions are to the entire company and its brand. I was fascinated to learn how real-time customer data is used all the way to the CEO level as a major source of data informing how to run the company. For this, American Airlines is at the forefront of a new way to manage business. Rather than living in isolation in marketing, marketers and business leaders benefit from real-time content and social networking. At forward-thinking organizations, salespeople curate real-time content, customer support offers real-time troubleshooting, and management uses real-time engagement metrics to inform business decisions. “We try to create customer value, and we try to create business value,” Pierce says of his company’s approach to real-time social media. “We’re building relationships with customers through social and building relationships internally through the value provided by our work. While Pierce was showing me around, I took interest in the team’s social media wall, a dashboard of real-time metrics displayed on a series of large video screens. On the day I was there, 5,130 people had mentioned American Airlines on social networks in the past 24 hours, and 2,666 of them geotagged their mentions with their location. 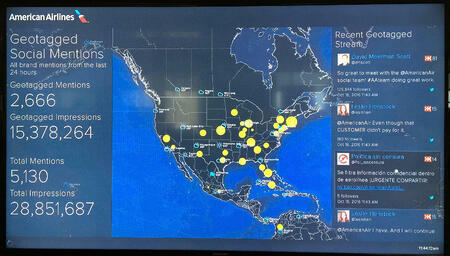 The monitors showed a scrolling set of tweets as well as recent images that people posted. The social media wall, as well as reports that are sent to management daily, weekly, and monthly, aren’t interesting just to a geeky visitor. The reporting and social data wall have become so important to management that they use it to gauge real-time reaction to new initiatives. “You know you have a good thing when we’ve launched a product or done an announcement and the VP of marketing will come up here and stand and watch the screens for the first hour to get a sense of what the customer reactions are,” Pierce says. “It has gotten to the stage now where leaders know customers will give immediate feedback through these social platforms, and this is where we can gain insight immediately. We can course correct and get a sense of reaction quickly based on the immediate insights that come out.” As I was learning about this use of real-time data, I was thinking how the vast majority of large companies would have convened a focus group or hired a team of researchers and then taken months to gather data. At American Airlines, big data in real time provides immediate intelligence that is used up and down the company to run the business. The team operates around the clock with 25 team members, several of whom are fluent in Spanish and another in Portuguese. “Our permanent team come from all different backgrounds at American,” Pierce says. “The last time we checked, the average seniority for the team was about 16 years with the company. We like to refer to them as super representatives, because in this job you’re going to get every kind of question and comment that you could imagine. They have to know so much about everything. And if they don’t know the answer, they have all the resources they need to find the answer. The real-time social networking team handles all sorts of issues for customers, such as rebooking flights, handling lost bag inquiries, and answering questions. But they also serve as the outward face of the brand, commenting on tweets like mine with Kobuk the hero dog. Perhaps you noticed that, unlike the large majority of organizations that hire people who are already so-called social media experts or hire young people because they grew up using social media, American Airlines takes people who are experienced in the business and teaches them the social media aspect. Once a new person on the social team has gotten experience responding via Direct Messages to individual customers, they might begin working on the public feed. If a customer provides his or her American Airlines AAdvantage frequent flier number when communicating through Direct Messages, as I have done, the team adds the number to the person’s internal social profile maintained at the airline. That way, a person’s social profile and customer profile are merged. In my case, the team knows me as more than just @dmscott on Twitter, who has more than 125,000 followers. They know I’ve also been a frequent flier for 20 years and have flown over two million miles on American Airlines, making me among their best customers. All of this information pops up on the social media representatives’ screens as they interact with somebody on a network. They can go back and look at the history of all social engagements between the airline and that customer. This is another example of how real-time social networking has become a fully integrated aspect of American Airlines’ business, much more than for a typical company that uses social networking just to promote products. I’ve interacted on Twitter with hundreds of companies I do business with, and I don’t know of any besides American Airlines that have merged public social networking feeds with private customer data to understand the total picture of the people they are interacting with. Toward the end of the day I visited the American Airlines Integrated Operations Center (IOC), where 1,600 employees operate in one arena-like room. The 150,000-square-foot facility is where real-time flight operations for the entire airline and its one million yearly flights are conducted, including dispatch, crew scheduling, air traffic control, maintenance operation control, customer service, and other functions. 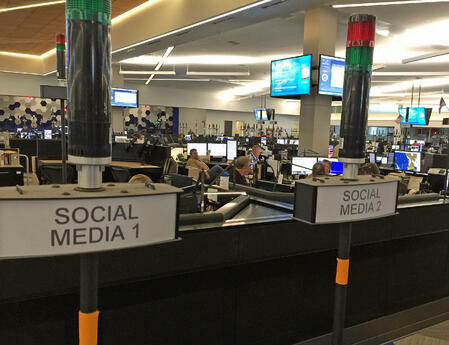 It was here, in the nerve center of the largest airline in the world, where it became crystal clear to me how important real-time social networking is to running the airline, or managing any large business. In fact, in the center of the room is what they call “the bridge,” which is where the operations manager for the entire American Airlines system sits together with a handful of key staff. And right next to the operations manager is a representative of the social team. I went to American Airlines to learn how the airline uses real-time social networking to communicate with customers who tweet cute photos like mine. I wasn’t expecting to learn how important real-time customer communications are for running the entire airline. American Airlines is an amazing example of the new rules of marketing and public relations at work throughout an organization. But it’s not just large organizations that can operate this way. I’ll share many more examples in these pages of companies small and large that are making the new rules work for them, too. Excerpted from the 6th edition of The New Rules of Marketing and PR by David Meerman Scott with permission by John Wiley & Sons, Inc. 2017, ISBN 9781119362418.